Even before Jesus, Lincoln was around! Well, they say that there was an iron age settlement in Lincoln in the century before Jesus was born, so that makes Lincoln pretty old. Not that you can tell instantly, it appears as any other city when you first drive in and I admit I only visited to see the cathedral. I arrived at night and so got that great night view from a couple of miles away. 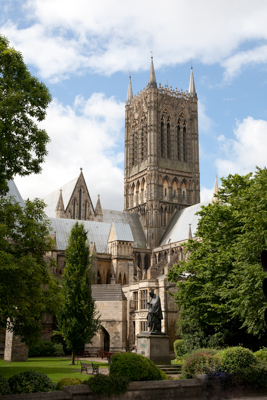 However visiting the next day was great and Lincoln remains ones of the best cathedrals I’ve ever visited. Notre Dame, St Eustace, St Leu and Durham all have their own draw, but Lincoln remains the best one for me for several reasons. As you walk around it, it has managed to retain a dignity in it’s environment. When you think of the broken backs of the excruciatingly poor believers who paid for this cathedral, that’s very important. However, the building is humbling even before you enter it and that again is how it should be given it’s purpose. The choir is clean and large and impressive, the transept light and airy and inviting, the eastern sunlight impressive as it shines through the stained glass windows. It dominates the city from the top of it’s hill and seduces you as soon as you enter with it’s warm light and homely feel. This is a fabulous cathedral and I love it.